I will be doing an oral presentation on a play next week. I am not sure if I should read the adjectives in this sentence, because it is followed by a quotation mark. 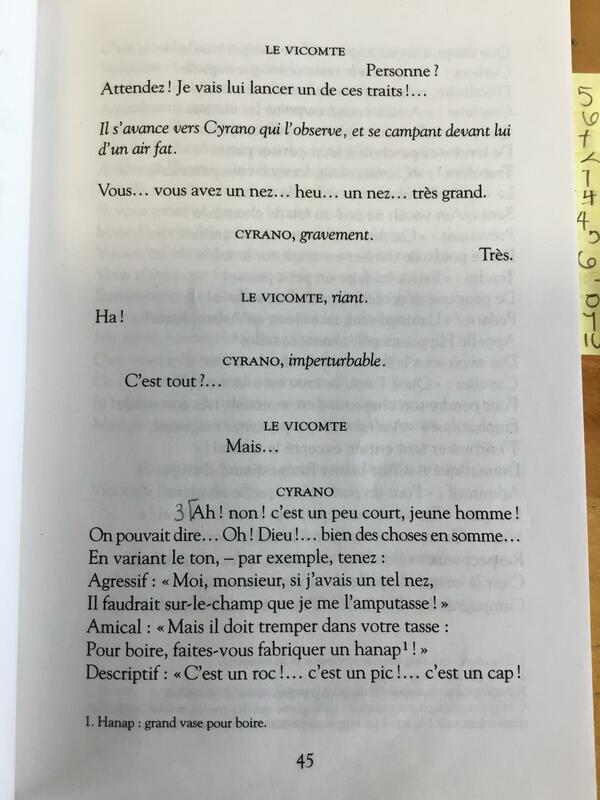 The image is a page from Cyrano de Bergerac, a french play. The word should be agressive, not agressif (which is the French for agressive.) And you're supposed to read it. The lines won't scan otherwise. Descriptive: ''Tis a rock! ... a peak! ... a cape! In this other translation, the lines won't scan if you don't read the adjectives. Notice how, if you include the adjectives, almost every line has exactly 10 syllables (alternating unstressed and stressed), while if you don't read the adjectives, the lines are all of varying lengths. This is iambic pentameter, so clearly you're supposed to read the adjectives. The French is in alexandrine verse, and similarly won't scan if you don't read the adjectives. Not the answer you're looking for? Browse other questions tagged literature reading or ask your own question. Are there any references that the English language is written and read from left to right and from top to bottom?